This species of “shelf” fungus produces very large, inedible woody fruit bodies which are shaped and colored grey/ brown to almost black like a horse hoof. It infects various species of hardwoods through breaks in the bark and lives up to 30 years on the sides of standing and fallen trees. On standing trees, it’s a parasite; on fallen trunks it becomes a decomposer. At their largest, they measure up to 18 inches across by 10 inches wide by 10 inches thick! This tinder fungus has helped our kind survive the harsh elements for millennia due to its unique fire portability and fire starter properties. Let me explain. Primitive people, Native Americans, and Virginia colonists used to hollow out these stemless woody mushrooms to carry slowly smoldering fire embers needed to kindle new fires from camp to camp, regardless of the weather. Equally important, is a rubbery inner layer of umber-colored flammable material known as amadou that when processed becomes highly flammable. Amadou boiled in water with wood ashes (lye water) and hammered to a pulp turns into a felt-like fabric that when teased into a threaded state becomes the most flammable tinder in all of Nature. All the ancients needed was tinder fungus amadou, flint and a metallic sparking tool to build their life-saving and life-giving fires. This ancient secret didn’t escape Otzi the Iceman, the remarkably preserved hunter/ mummy found in the Italian Alps in 1991. Otzi was carrying four pieces of tinder fungus in his survival kit when he died of head trauma and an arrow wound around 5,300 years ago! Amadou was also used to help fire many a flintlock rifle as the punk that ignited the gunpowder. The first written evidence of the tinder fungus came from the Ancient Greek Hippocrates in 415 BCE as a cauterization agent. It was first described scientifically by the famous taxonomist, Carl Linnaeus, in 1753, with the specific epithet fomentarius derived from the Latin reference to tinder. 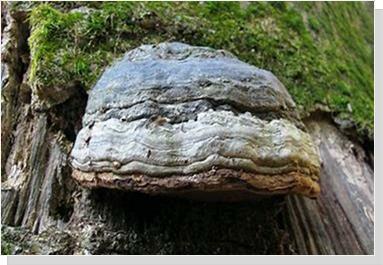 This fungus and its amadou felt have been used for centuries for many practical and medicinal purposes. 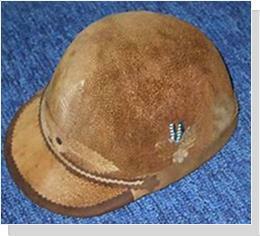 Early Europeans made caps, gloves, breeches, and other clothing from the felt. Early dentists had used it as a drying agent, old-world surgeons relied on the fungus as a styptic to staunch bleeding, and many a tribal healer sought the horse hoof fungus as a diuretic, laxative, and bladder disorder remedy. This unique fungus has also been recorded to have been used by Native Americans to make antimicrobial brews and poultices to treat soreness, infections, arthritis, and even frostbite. I’m always amazed how thousands of years of valuable practical knowledge on important species such as the horse hoof/ tinder fungus can fade in such a relatively short period of time. But for us, let’s not let these secrets of the forest wane. Fomentarius can vary in colour from a very light grey to almost black.